Summary: After trained examiners and accomplished business professionals performed a thorough assessment of their work, Jeffrey K. Liker with George Trachilis have been selected as recipients of an internationally recognized award from the Shingo Institute, part of the Jon M. Huntsman School of Business. The author and contributor will receive the award at the 28th International Shingo Conference occurring April 25-29, 2016 in Washington DC. LOGAN, Utah — The Shingo Institute, part of the Jon M. Huntsman School of Business at Utah State University, has awarded Jeffrey K. Liker, Ph.D., with the Shingo Research and Professional Publication Award for his book, “Developing Lean Leaders at all Levels: A Practical Guide.” Dr. Liker is professor of industrial and operations engineering at the University of Michigan and president of Liker Lean Advisors, LLC – a collection of top-notch lean advisors. He is an international best-selling author and recipient of 11 Shingo Research Awards. 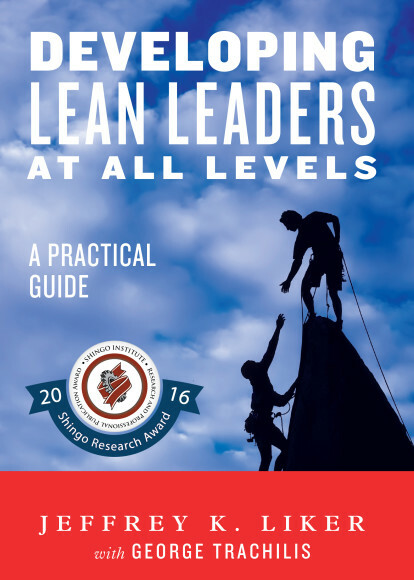 Trachilis, president and CEO at Lean Leadership Institute Inc., is a partner with Dr. Liker and a contributor to this book. In “The Toyota Way to Lean Leadership,” Dr. Liker and Toyota-veteran Gary Convis unveiled the secret of Toyota’s success in developing leaders who live the values and constantly improve the company and adapt to the rapidly changing environment. In “Developing Leaders at all Levels,” Dr. Liker builds on the theory in the original book and its four-stage model of leadership development: self development, developing others, supporting daily improvement, and aligning people throughout the entire enterprise using a common strategic planning process called hoshin kanri. The Lean Leadership Development Model (LLDM) presented in this book is intuitive and aligns well with accepted principles of operational excellence. It expands significantly on the elements of lean, structuring them in a more specific way that can be operationalized by lean practitioners. “Developing Lean Leaders” is a management must-read, and its purpose is to help you learn, practice and grow your lean leadership skills. Dr. Liker and Trachillis will receive the award during the Awards Gala of the 28th International Shingo Conference in Washington D.C. The conference is a five-day event featuring a selection of workshops, plant tours, keynote speakers and breakout sessions designed to provide ongoing knowledge, insights and experience for organizations in pursuit of operational excellence.